Muntanyans II Torredembarra - how do we know it is wetland? Muntanyans II - how do we know it is wetland? Does the Muntanyans II site at Torredembarra have wetland characteristics? Wetlands can be flooded or have water at or near the surface for at least part of the year. 1. 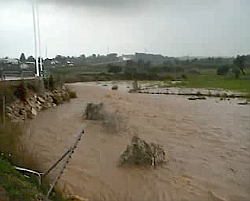 There is recent video evidence of flash flooding from the Gibert Torrent that discharges into the Muntanyans site. The flood images below are from Platform Salvem Muntanyans, October 2006. 2. 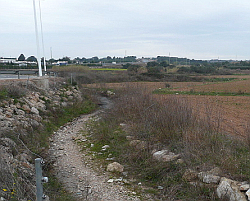 Wetland vegetation can be identified within the Els Muntanyans proposed development, as well as further inland within the drainage basin of the Gibert Torrent. 3. Wetlands have unique soils - hydric soils. These tend to be black in colour, do not hold much oxygen and are saturated with water most of the year. In the absence of oxygen, certain microorganisms produce hydrogen sulphide from organic sulphur, giving these soils a charactistic rotten egg smell.